The present building was constructed in 1982, moving from the old school in the village. 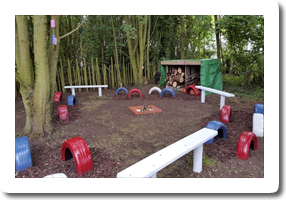 Over the past few years the school has had a number of improvements made to it including the extension of the Reception Classroom, the creation of an outdoor learning environment and the reshaping of classrooms. The school is bright, airy and welcoming making it the perfect place for learning. 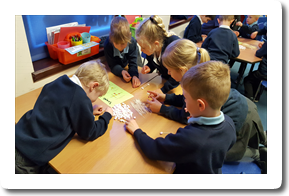 Each class enjoys a large, colourful, welcoming classroom filled with resources to help support the children's learning. Classrooms are layed out with it's current class in mind, taking on board the needs of the children. Much of the furniture in each classroom has been replaced with more child friendly furniture. All resources are easily accessible by the children. The reason behind this is to encourage children to become more independent in selecting the resources required to complete learning challenges (this relates to differentiation policy). 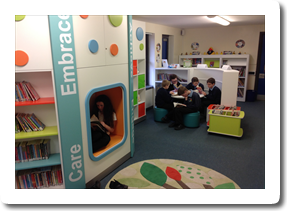 Each class also has a reading corner where children can select from a range of books, often relating to the current learning in class, which they can read during the daily 'Reading for Pleasure' sessions. We are now in the process of replacing our aging interactive whiteboards with brand new mult-touch interactive screens. This will be rolled out across the school. The school has a large hall which has a number of uses throughout the school day. Primarily it is used for P.E lessons where the children can take part in a wide range of sports from gymnastics and dance to basketball and benchball. The hall contains a variety of P.E equipment which is used both inside and out. Each morning the whole school gathers in the hall for collective worship. This is a time where we come together and reflect on the current half term value and the impacts this can have upon our learning and life. At lunch times the hall is used for everyone to sit down together and either enjoy a hot school dinner provided by the school's kitchen or a packed lunch brought from home. It is a time when children can mix with children from other year groups and make friends from across the school. The hall is also used for the staging of school productions and concerts. 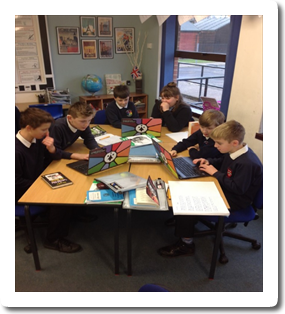 We believe that reading is one of the most important parts of the curriculum which is why we have spent £14,000 on the refurbishment of our library complete with new book units, seating and book booking system. We have organised all of the non-fiction books using the dewery decimal system and encourage children to use the information posters around the library to help them locate the book they need. Children regularly have the opportunity to use the library: whole class visits to read and explore the library; guided reading sessions; to reading to an adult; using books for research; swapping home reading books. One of the biggest room changes, which is still ongoing, has taken been the transformation of our old ICT suite to our exciting Wonder Room. This is a place classes will be able to go for drama, film viewing, experimental or exploratory tasks, music lesson as well as a break-out ground and intervention room. There are a number of displays and objects with the aim of inspiring the children. At the end of the day it becomes part of the provision for the Social Hub after school club. With the new greater emphasis of Food in Design Technology we felt now was the right time to refurbish our food technology room. It is now equiped with two cookers, two seperate four ring hobs and fridges. This room is also used by The Social Hub, our Breakfast and After School Club, as a base for the children to go to. IT provision at Thomas Bullock is currently undergoing some what of a transformation. We have removed our old outdated ICT Suit, converting it into the Wonder Room, replacing it with more mobile IT equipment. We recently have puchased 15 laptops and in the coming months will be purchasing another 15 to create two half class sets. We also have a number of iPads and tablet computers availble for the children to conduct research. We are currently undertaking a massive decoration programme across the school, which inlcudes the redoration of classrooms and corridors. We are also hoping to refurbuish our hall soon. Ramps to every entrance door. No steps inside or outside of school. No steep slopes inside or outside of school. All doors and corridors are wide enough for wheel chair access. The school has extenisve grounds which are used to maximum effect. The playground area is zoned so that children feel safe and secure. There is a smaller playground for The Ark (Reception), Australia (Yr 1) and Asia (Yr 2) classes on one side of the school and a larger play ground for Africa (Yr 3), South America (Yr 4), Europe (Yr 5) and North America (Yr 6) classes. 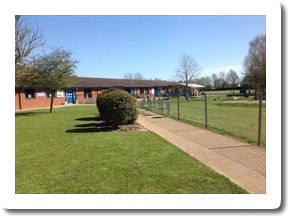 The school also has a large field which is used in good weather for P.E lessons as well as at break and lunch times. To one side of the field is the trim trail which all children are able to use. On the opposite side of the field is our chicken enclosure, where our resident chickens live! At the rear of the field is a wooded area, which children can explore as part of science. There is also a wild life area which contains a pond and different habitats. This area was refurbished during the second half of the Summer Term 2016 by a team from The Prince's Trust. 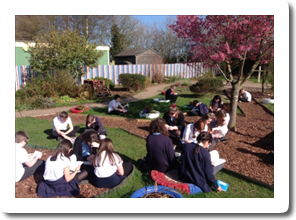 In 2016 an outdoor willow classroom was created to the front of the school, where classes can go to in good weather and share a book or take part in out door learning. There is also a garden area for the children to enjoy and contemplate in. This was recently refurbished by The Prince's Trust.